Ready, Get Set, Let’s Cook! Why Are Our Cooking Parties Valuable? We’ll Be The Butter To Your Toast! Nothing pulls family and friends together better than fun in the kitchen–add a fabulous meal as a reward and you’ve got a winning event! Family and Friends Cooking Parties are HOT! They are becoming the preferred way of bringing people together. Cooking together is a wonderful way of getting to know your extended family and friends. Your event is not just another party; it’s a unique story–a blank page waiting to be written! The Stocked Pot & Company Cooking School and Culinary Team Building Activities and Events in Winston-Salem, North Carolina. We are located in the Piedmont Triad, near Greensboro and High Point and near Charlotte, Raleigh, Durham, Cary and Chapel Hill and travel to South Carolina and Virginia also creates customized programs and events for family reunions as well as larger events. Our wonderful customers have found that our specialized approach is a fun and engaging way to build on existing relationships and to forge new ones! We are the original Cooking Party and Culinary Team Building Company in the Piedmont Triad and we guarantee unparalleled expertise and service. We set up and clean up so you won’t need to lift a finger! With over 30 years doing business in the Piedmont Triad, The Stocked Pot & Company has mastered the recipe for unforgettable group cooking classes and family and friends cooking party activities. Our hands-on and entertaining cooking events encourage bonding, improve communication, and foster camaraderie, all while whipping up fun in the kitchen! Every one of our Cooking Parties and Culinary Team Building events are perfect for families, friends and companies as well as for your next holiday event. Given the current popularity of “celebrity chefs” and cooking based TV shows, it’s no wonder that culinary cooking parties and team building as a bonding activity is extremely in vogue. Food has traditionally been used to bring people and families together, so why not cross it over into a family affair or workplace event and hold a fun and entertaining culinary cooking experience or company team building event as part of your next party, conference, or holiday party. Shopping Services and Ingredients Using the Freshest Seasonal Produce from Food Purveyors. Whether you’re putting together a fun family event, gathering a group of friends for a cooking party or throwing the best team building event ever, The Stocked Pot & Company has the perfect and memorable cooking party favors for your guests. Our selection of quality party favors includes the latest kitchen tools perfect for any kitchen, kitchen aprons, trophies, framed certificates of completion, and gift bags filled with the coolest kitchen gadgets. Build A Team. Make An Impact. This Charitable event is perfect for community service days or company retreats. And is the perfect morale booster to improve team spirit. Most importantly, this event makes a tangible and immediate impact on hunger in our local community. This event supports core values of community service while building collaboration and team communication. This Team Building Event is all about donating to a local charity. The teams get warmed up with a fun icebreaker to help get their creative juices flowing. Teams must work together throughout the afternoon to design and produce a number of delicious dishes that will be donated and delivered to a worthy charity at the end of the program. Everyone is asked to bring a canned or boxed food item to add to the donation of food that will be made at the end of our bonding experience. Your team’s creativity and teamwork will then be put to the test as they plan and cook an entire meal. Our professional chefs provide hands-on instruction and support as your team works together to create their dishes. This opportunity provides a dining experience for those less fortunate than ourselves. Food is one of the most basic needs of human beings, yet thousands of men, women and children in our community go to sleep hungry every night. Our Cooking For A Cause program allows corporate teams or families to bond while making a meaningful and worthwhile donation of food to people in need in our community. Your group will cook and eat food they prepare during the event. What a great way to build your team and give back to our community! Making appetizers is a delicious and creative team building activity for your entire team. Take your family or group event to the next level with a hands-on team event. Give everyone a chance to explore diverse menus with flavors from around the world. Our Sumptuous Tapas/Small Plates event is a great get-to-know-everyone format, as guests cook together and share their creations with the rest of the group. Members of each team will naturally develop stronger relationships and build trust and confidence in each other throughout this fun and tasty event. Food is the universal language and nothing brings people together better! The Tapas and Small Plates event is more than hors d’oeuvres on trays – it’s cooking together as a social event that takes you around the globe with family, friends and colleagues. The teams get warmed up with a fun icebreaker to help get their creative juices flowing. The teams will prepare appetizers from scratch using recipes provided and will have full use of our kitchen facilities. Our chefs will guide the team as they create their wonderful creations. The team will divide into groups along with one of our chefs to assist in creating a fabulous tapas/small plate meal. We end the event with a wonderful cocktail party where everyone relishes in the fruits of their labor. The menu options include salads, appetizers, and desserts. Making Pizza is a delicious and creative team building activity for your entire team. The teams get warmed up with a fun icebreaker to help get their creative juices flowing. The team will prepare and cook a two course meal. They will be creating a pizza, calzone or Stromboli based on the ingredients given. Our chef will guide the team as they create their wonderful creations and we will end with sharing the meal together. Having fun in our kitchen making pizza is an event as well as a culinary feast! The teams will prepare salad dressing paired with a freshly tossed garden salad. Next they will make bread dough for the pizza, calzones or Stromboli and finally they will prepare tomato sauce from scratch. You will learn step by step the process of crafting the perfect pizza pie. We will put the most popular toppings together and add a few gourmet toppings too. Our chefs will guide the teams as they create their wonderful masterpiece. The team will divide into groups when making the pizza dough and will join back together to make the tomato sauce from scratch. We end the event with a wonderful pizza party, say goodbye to frozen and delivery pizza because now you can make the very best pizza at home! Our “Sushi Making Challenge,” is a hands-on culinary event that your group will surely enjoy. We will demonstrate the art of making sushi rice and cutting vegetables and seafood then use them to roll the perfect sushi. The teams get warmed up with a fun icebreaker to help get their creative juices flowing. Your group will be divided into teams and face off in a timed competition that will rely on creativity and teamwork. Each team will need to pick a Master Sushi Chef of the team the rest of the team will be Sous Chefs. Each of the teams will be given their fresh vegetables, seafood and many wonderful ingredients to fill their sushi rolls. Each team will be responsible for prepping the vegetables, rolling and presenting one completed sushi roll on our Sushi Platters and then will present to a chosen panel of judges. Our chefs will guide the teams as they create their wonderful Sushi creations. We will end with the teams enjoying their fresh made Sushi rolls. As your team becomes one with the sushi mat to create the perfect sushi roll, remember, only one team can be named Master Sushi Chefs. Our Chili Cook-Off combines communication and innovation and turns it into a fun, exciting and delicious team building event. Your group will be divided into teams and face off in a timed cooking competition that will rely on creativity and teamwork. The teams get warmed up with a fun icebreaker to help get their creative juices flowing. Each of the teams will be given their base ingredients and will have full use of the stocked spice shelf, dry goods, freezer and refrigerator. They will be responsible for prepping, cooking and presenting their chili. Your group will work together in our kitchens as they prepare their own special creations. Our professional chefs provide hands-on instruction and support as your team works together to create their dishes. Each team will need to pick an Executive Chef of the team the rest of the team will be Sous Chefs. This mild to spicy cooking competition will rely on each team member and it is the Executive Chef’s responsibility is to oversee the specific assignments for the entire team. The Executive Chef of each team will stand in front of the group and will talk about their experiences and how they overcame the challenges that they faced. They will also discuss the new skills that they learned and the fun that they had. One team will emerge triumphant as the reigning Chili Cook-Off Champions! Judges can either be members of your company or our chefs. Now comes the best part, dinning on the wonderful Chili made by each team. Tossed garden salad and bread and will be served with the meal. Our chefs stay with each of the teams and guide the teams as they create their wonderful chili. The Stocked Pot & Company knows that the kitchen is an ideal venue to achieve your goals in team building. Our events will challenge your family and co-workers and are always fun. A fun option for this tasty event includes adding a Sangria Making Challenge. In this three-step competition, your group will be divided into teams and face off in three quick challenges that will require excellent teamwork and time management. This challenge is great for small and large groups. We start one challenge at a time and finish with some tasty appetizers made by the teams. This is a wonderful and perfect event for a group of foodies! Teams will begin with a head-to-head Blind Taste Test. Team members will take turns tasting 5 foods while blind-folded. One point will be awarded for each correct answer. Teams will then move to the Food Trivia Round. Each team will have 5 minutes to answer as many food trivia questions as possible. One point will be award for each correct answer. Teams will then finish with a 60 Minute Appetizer Cooking Relay. Each team will select half of their members to participate before beginning the relay. The remaining team members will coach and cheer from the sidelines until it is their turn. Teams will be given recipes and ingredients. The first half of the team will have 30 minutes to prep and cook the food and then must hand off the cooking to other half of the team who will have 30 minutes to finish cooking the dishes and complete the presentation of the dishes. The appetizers must be finished when the final bell rings at the 60 minute mark. The teams will be judged on taste, presentation and teamwork and awarded a minimum of 5 bonus points and a maximum of 15 bonus points. The team with the highest number of points wins! In this “Chopped Style Challenge” your group will be divided into teams and face off in a timed cooking competition that will rely on creativity and teamwork. The teams get warmed up with a fun icebreaker to help get their creative juices flowing. Each team will pick an Executive Chef of the team the rest of the team will be Sous Chefs. Next the teams will need to create a recipe name and come up with a list of ingredients based on the secret ingredients given. All the teams will have the same secret ingredients and will have one and a half hours to then prep, cook and present the meal in front of preselected judges. No recipes here, it’s all up to the teams working together to complete this challenge. Teams are presented with a mystery basket of secret ingredients. Teams have 90 minutes to make their dish and must incorporate their secret ingredient in a creative and delicious way. Each of the teams will be given full use of our dry goods, spices, freezer and refrigerator for their use. The Stocked Pot & Company culinary team of Chefs will serve as team coaches. After the cooking is complete, each team is given time to give a verbal presentation to a chosen panel of judges and will be scored on taste, teamwork, presentation, creativity and the use of the mystery basket ingredients. Our most popular Culinary Team Building Event, the “Iron Chef Challenge,” is a hands-on culinary event that your group will absolutely love. The Iron Chef Challenge is a celebratory team bonding experience in which guests work in teams to prepare delicious three to four courses meals. Teams will be recreating what one may find on a five-star restaurant menu and will culminate in a seated gourmet meal. Your group will be divided into teams and face off in a timed cooking competition that will rely on creativity and teamwork. Each of the teams will be given their secret ingredients for their courses and will be responsible for prepping, cooking and presenting one to two dishes to complete a three to four course meal. Our professional chefs provide hands-on instruction and support as your team works together to create their dishes. Each team will need to pick an Executive Chef of the team the rest of the team will be Sous Chefs. Your group will work together in our kitchens as they prepare their own special creations. Next they will need to create a recipe name and come up with a list of ingredients based on the secret ingredients given. They will have a certain time frame to then prep, cook and come up with a beautiful presentation of their dishes. The Executive Chef of each team will stand in front of the group and talk about their experiences and how they overcame the challenges that they faced. They will also discuss the new skills that they learned and the fun that they had. Now comes the best part, dinning on the wonderful meal that each team created. Our chefs stay with each of the teams and guide the teams as they create their wonderful dishes sharing with them culinary tips along the way. The Stocked Pot & Company knows that the kitchen is an ideal venue to achieve your goals in team building. Our events will challenge your family and co-workers and are always fun. Only one team will remain supreme! Making Ice Cream using liquid nitrogen is the most fun you will ever have so get your phone or video cameras ready! The teams get warmed up with a fun icebreaker to help get their creative juices flowing. Each team will prepare their own ice cream creation. They will need to pick an Executive Chef of the team and the rest of the team will be Sous Chefs. Next they will create a recipe name and come up with a list of ingredients based on their selection from a central ingredient table. The central ingredient table will have a wide variety of savory and sweet ingredients to choose from. Our Executive Chef will give instructions to the entire group on the basics of making ice cream. The teams will have a certain time frame to then prep and mix their creation with liquid nitrogen controlled by our trained chefs. The Executive Chef of each team will then stand in front of the group and talk about their experiences and how they overcame the challenges they faced. They will also discuss the new skills that they learned and the fun they had. Now comes the best part, eating the wonderful ice cream concoctions that each team created! Cake Sculpting is a delicious and creative team building activity for your entire team. Creativity is the key to success as the teams work together to build confectionary masterpieces. Your group will be divided into teams to build a multi-layer themed cake. This challenge is great for groups of 6 up to 200 or more. The event begins with an introduction to cake-building mechanics, frosting and piping techniques. Every team will use cake and icing to make their team artistic cake sculpture. The teams get warmed up with a fun icebreaker to help get their creative juices flowing. Each team will come up with a theme and they will design a three dimensional theme on paper before sculpting the cake. They start with a variety of flavored sheet cakes and start cutting the cakes and the decorating begins! There are no rules here; it’s a no holds barred competition. Icings, gels, food coloring, edible spray paint, an assortment of candy, sprinkles, popsicle sticks, and much more are provided to enhance this team building event. When the masterpieces are complete, each team will take a Cake Tour and see all the wonderful cake creations. The Executive Chefs of each team will tell the theme and story of their cake sculpture. Now it’s up each person to vote for the winner. The team with the most votes wins! This team event is both delicious and fun; cake sculpting is the perfect team building event for your small or large group. It’s a wonderful way to establish camaraderie, improve team dynamics and foster team bonding. You may want to upgrade this event to include lunch or dinner service or a tapas/small plates menu prepared by The Stocked Pot and Company Cooking School. Our Fabulous Chocolate Party is a hands-on culinary event that your group will fall in love with. Your group will be divided into teams and face off in a delicious cooking competition that will rely on creativity and teamwork and taste. The teams get warmed up with a fun icebreaker to help get their creative juices flowing. Each of the teams will be given their two to three chocolate tasks to complete. Our professional chefs provide hands-on instruction and support as your team works together to create their dishes. Each team will need to create a team name and come up with a list of ingredients based on the secret ingredient chocolate items given. They will be responsible for prepping, cooking and presenting all the dishes. Your group will work together in our kitchens as they prepare their own creative chocolate masterpieces. Each team will need to pick an Executive Chef of the team the rest of the team will be Sous Chefs. At the end of the cooking process the Executive Chef of each team will stand in front of the group and talk about their experiences and how they overcame the challenges that they faced. They will also discuss the new skills that they learned and the fun that they had. Now comes the best part, eating all the wonderful chocolate masterpieces each team created. Our chefs stay with each of the teams and guide the teams as they create their masterpieces. The Stocked Pot & Company knows that the kitchen is an ideal venue to achieve your goals in team building. Our events will challenge your family and co-workers and are always fun and delicious. Kick start your next holiday party with great menu options from The Stocked Pot and Company Cooking School. Are you are stumped for ideas for your family holiday event? Looking for fun, and fresh ideas for your next office holiday party? Then why not consider booking a fun and exciting cooking party or team building event for this year’s Holiday Party! The Stocked Pot & Company has a vast number of delicious cooking parties and exciting team building activities that work perfect as a family get together or an office Holiday Party. Have a fun and relaxing event by cooking and eating together. Forget your typical restaurants, The Stocked Pot & Company creates fun and excitement with interactive cooking parties to give your friends, families, or staff a memorable holiday party guaranteed to create smiles – even from your boss! Fire up some culinary competition at your next company team building event. Go knife to knife as co-workers work together to compete for the winning dish! There’s a reason why the party always ends up in the kitchen! At The Stocked Pot and Company Cooking School, we turn a cooking lesson into a unique dining experience. Culinary Team Building Events are a great way to enjoy spending time with your coworkers. If you’re looking to put a tasty twist on your next Culinary Team Building Event or a Company Holiday Party, then look no further than The Stocked Pot and Company Cooking School. The guests arrive, wine and beer is served, appetizers are ready to nosh on and the cooking begins! Our chefs will demonstrate the recipes and techniques and you and your co-workers join in on the fun. Each of your guests receives commemorative recipes so they can show off their newly learned skills. After the cooking is complete, everyone relaxes, and enjoys the delicious food and beverages and chat about the new memories just made! 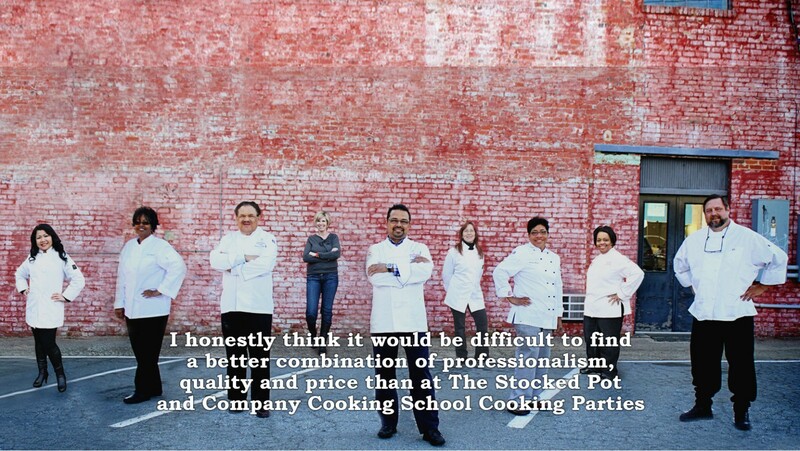 Contact us today for your Fabulous Team Building Event at The Stocked Pot and Company Cooking School. We will help you plan your event that you and your co-workers will remember for many years to come. Fire up some culinary competition at your next family get together. Go knife to knife against friends and families or work together to compete for the winning dish! There’s a reason why the party always ends up in the kitchen! At The Stocked Pot and Company Cooking School, we turn a cooking lesson into a unique dining experience. Cooking parties are a great way to enjoy family and friends. If you’re looking to put a tasty twist on your next children’s or adult’s Birthday Party, Bridal Shower, Bachelorette Party, Bridal Engagement Party, Anniversary, Rehearsal Dinner, Girl’s or Guy’s Night Out, or a Company Holiday Party–look no further than The Stocked Pot and Company Cooking School. When guests arrive, wine and beer is served, appetizers are ready to nosh on and the cooking begins! Our chefs will demonstrate the recipes and techniques then you, your family, and friends join in on the fun. Each of your guests receives commemorative recipes so they can show off their newly learned skills. After the cooking is complete, everyone relaxes and enjoys the delicious food and beverages and chats about the new memories just made! Traditionally wedding, bridal showers and bachelor parties were occasions during which the bride or groom and their friends and relatives gathered together at someone’s house or went out to a club to celebrate before the big event. This basic idea remains intact, but today there are new ways to enjoy bridal showers and bachelor parties—like a cooking party at The Stocked Pot! There are plenty of great reasons to throw a cooking party. Besides being fun, they serve a purpose–young couples need to know how to cook when they begin their life together. Everyone attending a cooking party or cooking class at The Stocked Pot & Company will learn wonderful cooking skills and will bond together tastefully. Attending a cooking party or a cooking class at The Stocked Pot & Company is great way to learn new cooking techniques, including grilling ribs, steaks and fish, flaming bananas foster, learning tasty new recipes and indulging in one of your favorite meals. It’s up to you to choose how involved you want the class to be. 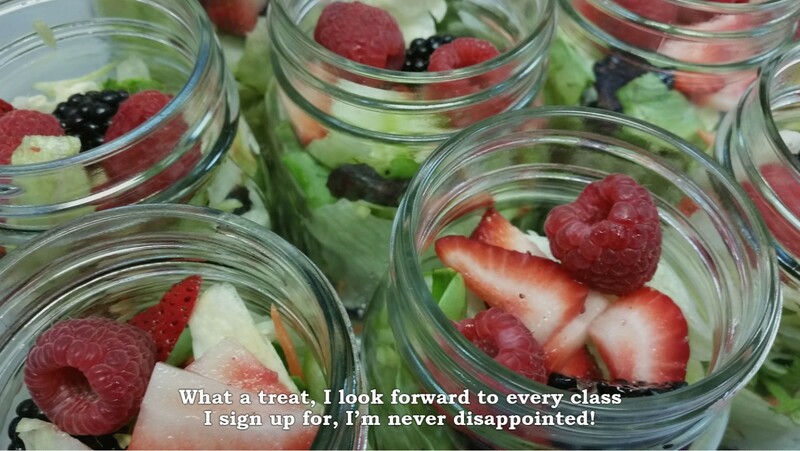 Our hands-on classes get you involved in every step of the process so you can learn how to recreate the meals at home. A demonstration class lets you can sit back and relax with a glass of wine or ice cold beer and watch our expert chefs cook an amazing meal just for you. Our chefs and staff will be there to guide you along the way and when the food is prepared everyone can sit down and enjoy the delicious meal together. 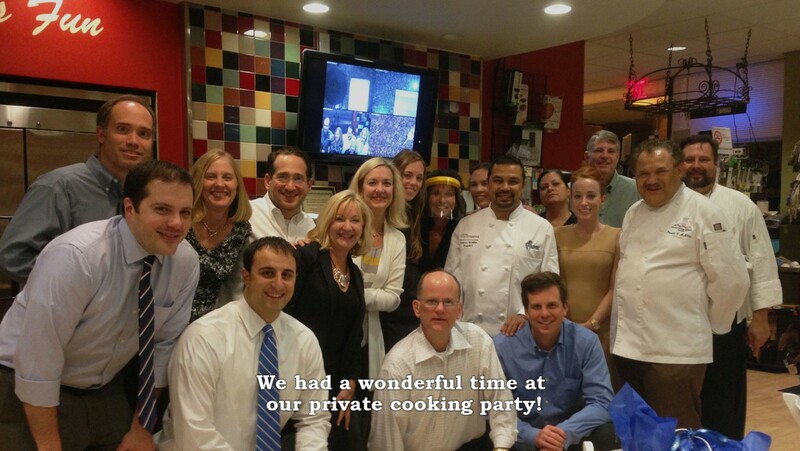 Cooking parties and demonstration cooking classes will make your party memorable! Make the bride and or groom feel extra special before their special day by treating them to a fun and tasty cooking party full of fun, food and great memories. Watch, Learn, Eat and Drink! If the typical BBQ picnic or dinner isn’t cutting it, you have found the right place! Trade the typical ho-hum rehearsal dinner for some fun in the kitchen and try our recipe for the best rehearsal dinner you have ever been to. The Stocked Pot & Company offers dining for up to 30 guests in the Main Dining Room. At The Chefs Table you enjoy a privileged VIP experience. Settle in for an experience that is true culinary theater. It’s interactive and perfect for the foodie in you. Chef Donald McMillan C.E.C. A.A.C. serves up tasty meals cooked right before your very eyes. We start with salad served in mason jars at your table side along with crusty bread and a ramekin of extra virgin olive oil and balsamic glaze. Wines are on the tables and commemorative recipes for every dish created on the menu. Watch, Learn, Eat and Drink! Sit back and enjoy watching Master Chef Donald McMillan C.E.C. A.A.C. prepare your selected menu and listen to the amazing stories of his culinary travels in over 55 countries on all 7 continents. And don’t forget to end the night with a delicious dessert, what better way to do this than have a flaming dessert served just for you. The Stocked Pot & Company has accomplished and qualified chefs and teambuilding staff that will gladly lead activities in your workplace, conference facility, hotel or wherever you see fit. 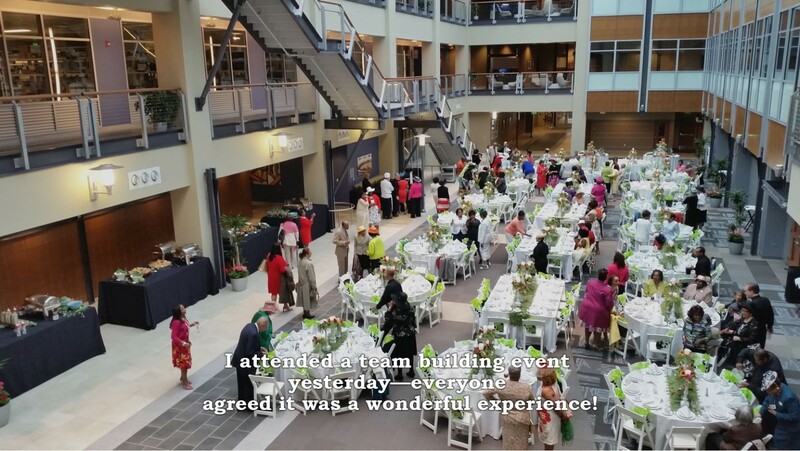 Having trouble finding a location to host your corporate event? The Stocked Pot & Company is the perfect place for your group for culinary team building and corporate activities. By using marshmallows and spaghetti and attaching them together you will make your very own castle. The castle with the tallest height wins. Measure from the bottom marshmallow to the top marshmallows. Fill a jar with candy. Guests write on a small piece of paper how many pieces of candy they think are in the jar. The one that guesses closest to the actual number wins the candy. Instead of candy in a jar, guess how many seeds are in an orange. Guess the length of a ball of butchers twine. Guess the weight of a head of cabbage. Place various items in several containers such as paper bags or cardboard boxes and let guests feel inside each container and guess the contents. Look for items that vary in texture and contain an element of surprise. Try exotic fruits, brown sugar, crackers, dry beans, salad mix, salad dressing, a bottle of hot sauce – whatever you can think of. Everyone writes three things about themselves on a piece of paper – two true statements and one false statement. Each person then reads their own statements and everyone else tries to guess which one is false. For this variation, gather everyone’s statements, which were written without the guests names. Then read one person’s written statement at a time–ask everyone to first guess who wrote the statements and then guessing which statement is false. Without stating why, invite guests to grab a small handful of M&Ms but not eat them yet. For every M&M, each person must say one thing about themselves. How many times in a row can you bounce a balloon off your head? Stand in a circle and have one person go at a time or have everyone in the circle take turns bouncing the balloon without letting it touch the ground. This ice breaker is great for young kids and the young at heart. Attending a private cooking party is great way to learn new cooking techniques. We will help you plan a fabulous event that you, your family and friends will remember for many years to come. We are passionate about making great tasting food and beautiful presentations! Contact us today at 336-499-5844. Be sure to check out our catering company, Catering by Simple Elegance.